If Ella asked me this question, it would be different today than it was ten years ago when she was born. With every day that passes, I see my daughter, Ella, as more of a human being. It sounds strange. Who doesn’t see their child as a human being? Yet, as the father of a child with special needs, it’s easy to see all the differences over the shared traits which make us human. It took awhile for us to get used to walking into a restaurant and everyone knowing who she was. 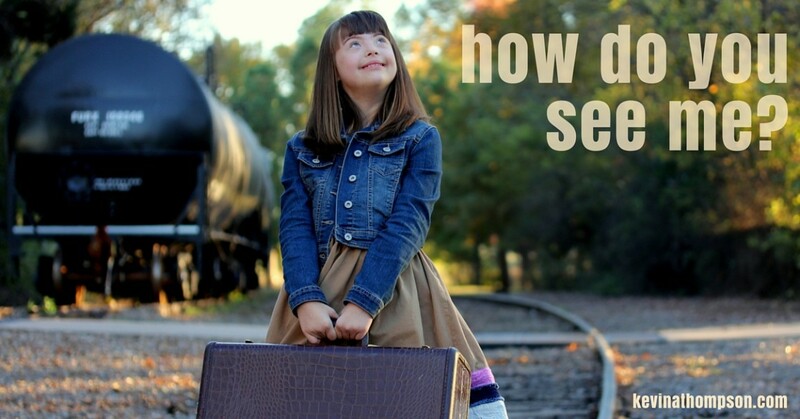 Living in a small town, there aren’t many kids with Down syndrome who are her age. Instead of people getting to know Ella and then viewing her diagnosis through her, many people knew her diagnosis and viewed her through it. Some view her as far more limited than she is. Making assumptions based on what they know about Ds, they assume Ella is more restricted than she is. She often uses this to her advantage. She manipulates new people into doing things for her which she can do on her own. We warn every new authority figure that they will be manipulated and that’s ok. With time, they will learn when she is playing them. Some view her as far more angelic than she is. We can’t count the number of times have we heard, “They are so loving.” Jenny and I laugh out loud. Ella is loving…to some. But she is far more likely to pull someone’s hair than give them a surprise hug. She’s not an angel. She is a fully alive–fully fallen–human being. Without question, her diagnosis gives a deep insight into who Ella is. Her features are as much her diagnosis as they are the result of her parents. At times I can see pictures on the internet of other children and at first glance assume it is her. Yet far more than being like everyone with Down syndrome, she is like everyone with or without a diagnosis. Her desires are the same as everyone’s desires. She wants to be heard. One Saturday I was working in my home office when Ella asked for something. I mumbled an answer and she firmly said, “You aren’t listening to me.” She was right and I was proud of her for standing up for herself. I can’t help but think it was frustration born from far more than that one moment. When people see her diagnosis rather than her, it’s easy to assume she has nothing to add. When we see Ella for who she is, we are interested in her perspective. She wants to connect. In every way a human being desires to connect with others–as family, friends, peers–Ella desires to relate to others. As she transitions toward being a teenager, one very clear development is occurring–she is starting to show signs of what eventually will be a desire for a boyfriend. While I was hoping we could skip this aspect of life, it is a common desire so I shouldn’t be surprised it is growing within Ella. I knew very little of Down syndrome when Ella was born. Ten years later, I’m still learning. What strikes me the most at this moment about Ella and her diagnosis is how completely normal she is. While many things are more challenging for her, nearly every desire is the same. She wants what we all want. When I see Ella, I see a very typical ten-year-old little girl who, sadly, isn’t as little as I want her to be. How Many Chromosomes Will We Have in Heaven? 2 Responses to Ella: How Do You See Me? I have worked with children with disabilities for 25+ years. Learning to teach above my expectations often brought beautiful moments of love and laughter for the student ,as well as the teacher. teaching children to try their best is so rewarding to watch. Their personalities develop, their voice becomes strong and they learn to be friends and to laugh at times. the ‘whole’ personal identity can shape a child to be successful and to become a well-trained worker. I often see students I taught and love it when they say things like: “she taught me to tell jokes, Mama”. work times and play times become meaningful integrated parts of the day. and they seem to love learning if it is offered with opportunities for success.